This is by way of a short tidying-up exercise to close the year. See the Download News archive here. Ricercar Consort/Philippe Pierlot  rec. November 2012. DDD. Volume 43 of the complete BIS series with Masaaki Suzuki couples Nos. 110 and 151 with a non-Christmas cantata, No.57 (BIS-SACD-1761) and there are other albums with two of the three in various combinations, but to the best of my knowledge there is no direct current competitor with this exact coupling, so if you are looking to fill precisely these three gaps in your collection, this offers the ideal solution. After the opening sinfonia, borrowed from Bachs own Suite No.4, the singing in the first chorus of BWV110 is rather forthright and I thought at first that these performances were going to be a little unsophisticated* but matters soon improved. The joy of the Lutheran Christmas is stressed in the notes and in the performance and my ear soon adjusted to the rather bright and forward recording. You may find, paradoxically, that the 16-bit lossless and the mp3 tame the brightness somewhat, though at the loss of some detail. The top version is at the unusual 24/88.2 setting which Windows earlier than Version 8 wont read  if your DAC doesnt automatically adjust to 44.1 you may need to alter the setting to that manually. I still marginally prefer Suzuki  you can add his version of No.63 with 61, 132 and 172 from BIS-CD-881  or Gardiner but the latters versions of these three cantatas are scattered across several albums: 32, 63, 65, 123, 124, 154 and 191 (SDG174, 2 CDs); 40, 91 and 110 (SDG113); 57, 64, 133 and 151 (SDG127). * I see that Simon Thomson  review  attributes his dissatisfaction to the one-to-a-part chorus, but I dont find that a problem. Overall we agree that this is a joyful set of performances despite our reservations. If youre still not sated with Christmas music and youre looking for something rather tacky, try James Galways Christmas Carol on RCA, a series of arrangements of the old favourites  I suppose that legitimately describes John Rutter by now, a tradition in his own lifetime  for choir, flute and orchestra: from amazon.co.uk (mp3) or iTunes or stream from Naxos Music Library. Avoid this, however, if you cant abide a gloopy arrangement of Bachs so-called Air on the G string in the manner of the Albinoni (Giazotto) Adagio. Performers include James Galway himself on flute, the BBC Singers and the Royal Philharmonic Orchestra. Angela Hewitt (piano)  rec. August 2012. DDD. As before, Angela Hewitt combines sonatas from all three periods of Beethovens career. My personal preference is to have an album of works from the same period, but this alternative also works well. By now most readers will know what to expect from Hewitts Beethoven and there are not likely to be any surprises fourth time around  see review of Volume 3. Clarity and tranquillity are greatly in evidence, especially in Op.22, though she didnt quite convince me that Beethoven was right to tell his publisher that the work hat sich gewaschen  its the cats whiskers. Everything is very good without quite storming the heights; try the scherzo of Op.33/3 (track 6) for Hewitts Beethoven at its best: not surprisingly, Hyperion have chosen this as their free download track  the playing in this movement made me sit up and take notice just when I was thinking that the whole album would be sure and safe but not quite inspiring. The recording is up to Hyperions usual high standards, especially in 24-bit format, even though thats only 24/44.1. I do hope that Hyperion have enough of the distinctive cover pictures to complete the series. The complete opera, from which this track is taken, is due for release soon from iTunes and Amazon on Beulah 1PD89. There are plenty of good recordings of the overture, some coupled with three of the dances, but the Czech performance of the complete opera is special, despite the attractions of better-recorded and idiomatic versions by Kempe (EMI Electrola, in German) and Mackerras (Chandos, in English). Watch out for its appearance. BBC Symphony Orchestra/Gennadi Rozhdestvensky  rec. Flanders Festival, September 1978 (Tchaikovsky); Royal Albert Hall, August 1981 (Janáček). ADD. Weve already had Rozhdestvenskys BBCSO recording of the Tchaikovsky Fourth from ICA (ICAC5035: Recording of the Month  review); Dan Morgan described it as a stunner. Can his Fifth live up to expectations? Can it even rival my benchmark, from fellow Russian Yevgeny Mravinsky, a comparison almost deliberately invited by the ICA notes? In one respect, no, because Mravinskys recording was made with the Leningrad Orchestra and Russian orchestras sounded distinctive in those days  a mixed blessing. In other respects, however, this has become one of my favourite recordings of the symphony, making the Jansons (below) seem lacking in spontaneity. Though the BR Klassik recording is much more recent, the ICA sound has come up very well indeed, especially in the lossless version. Perhaps the playing is a tad less secure in places than the Bavarians  both are live recordings but Jansons team give him a studio-quality performance  but I dont want to make too much of that. Rozhdestvenskys pulse is also more consistent than Jansons and where he does apply rubato it sounds perfectly natural. Some may find the performance unexciting by comparison with Mravinsky but it works very well for me because its unforced and therefore complementary to the Leningrad recording. One small complaint  Id have placed Taras Bulba first, though that, too receives a powerful performance, but you can re-programme when playing or even re-number the tracks permanently, but back the music up first and do it carefully. Id still place Mravinsky top of my list and his recording comes on a mid-price 2-CD set with equally stunning performances of the Fourth and Sixth symphonies (DG Originals 4775911  April 2010 Roundup: NB corrected catalogue number; download from prestoclassical.co.uk, mp3 and lossless). After that take your pick of Szell, currently reduced to just £3.95 from 7digital.com (no filler), Monteux, whose RCA recording, sadly, seems to be currently unavailable in the UK*, Alto/Rozhdestvensky, available at budget price from MusicWeb International  see also below  and the new ICA/Rozhdestvensky. Jansons recorded the Fifth Symphony for Chandos some time ago and that recording has remained in most peoples top few recordings of the work. This more recent live performance will also have many admirers  the applause at the end demonstrates that  and there is a great deal that I enjoyed, not least the quality of the playing, but I found myself time and time again mildly annoyed at this or that little quirk, mostly a seemingly well-rehearsed rubato or change of dynamic level and in the final analysis these ruled out this recording for me. Try it from Naxos Music Library, where youll also find the ICA and Rozhdestvenskys earlier Russian recording on the budget Alto label  review  and youll soon know whether its for you or not. Faced with a choice, however, between Jansons and Pletnev (Pentatone, also with Francesca da Rimini), a recording which I thought thoroughly off-message yet which received a 5+5 star review elsewhere, Id unhesitatingly choose Jansons. Bergen Philharmonic Orchestra/Sir Andrew Davis -rec. 2013. DDD/DSD. CHANDOS CHAN/CHSA5131 [78:32]  from theclassicalshop.net (mp3, 16 and 24-bit lossless and surround sound). Also available as hybrid SACD. My first thought was that there would be a considerable degree of overlap with the Danacord recording Delius: Norwegian Masterworks (Bo Holten, DACOCD592  review) but, in fact, only the obvious choices, Eventyr and Sleigh Ride are duplicated. Whereas Holten recorded all five Songs, in his own arrangement, Sir Andrew Davis selects just two and instead of Paa Vidderne, a symphonic poem inspired by Ibsens work of the same name, and Folkeraadet, incidental music to a play, which isnt even included in Beechams Delius collection, Holten rounds off his selection with the better known Song of the High Hills. On hearing the first Cuckoo, which Ive always thought of as archetypally English, is a surprise inclusion on the new Chandos recording, the justification being that its based on a Norwegian folk song. Your choice in terms of contents will depend on whether you prefer the better-known (Danacord) to the less well-known (Chandos, apart from the Cuckoo). Those who know Daviss earlier collection of Delius recordings on Warner Apex  a wonderful bargain offering, well worth having whatever other Delius you may have*  and his recent Chandos Delius offerings (CHAN10742  review; CHSA5088  review; CHSA5094  review and Recording of the Month review) will not be surprised to hear that the new recording enshrines some top-rate performances. * 85738908462  review of earlier 4-CD set. Only the Cuckoo overlaps with the new recording. Ive already, inevitably, mentioned Beecham and his EMI recordings remain my benchmark, still sounding well for their age and available very inexpensively as 5/6 of the English Music collection (EMI/Warner: Bargain of the Month, July 2011/1 Roundup  review and review: download from 7digital.com). To take the best-known work on the new album, the Cuckoo, I have to admit that Davis and his team come very close to matching Beecham or that other doyen of Delius music-making, Vernon Handley, whose Classics for Pleasure recordings are unfortunately deleted on CD, though his Cuckoo is included in Essential Delius (EMI, budget 2-CD set  download review: from 7digital.com). In one respect the Chandos has a clear edge over the Danacord, in that its available not only in very good 24/96 sound but also (for a price  £19.99) in surround sound. By mistake I left my DAC set at 24/44.1  a mistake I frequently make  and thought the recording very good; changing to 24/96 brought even better results, so it is worth paying extra for 24/96. All in all, this is an interesting and attractive album for those who already have recordings of the basic Delius works such as those that Ive mentioned or Chandoss own Essential Delius 2-for-1 set with fine performances directed by Hickox, Handley and Del Mar, CHAN241-37  January 2009 Roundup. CHANDOS CHSA/CHAN5127 [68:43]  from theclassicalshop.net (mp3, 16 and 24-bit lossless). Also available as hybrid SACD. Weve reached Volume 3 of Chandoss Holst edition, originally slated for Richard Hickox but now in the equally capable hands of Sir Andrew Davis. There are not many alternatives in the catalogue for either of these works, though what we have is so good as to be well-nigh indispensable, especially so in the case of the Lyrita recording of The Mystic Trumpeter (SRCD.270, with Parry and Vaughan Williams: Recording of the Month  review and review). For two different views of the Naxos recording, coupled with The Planets, see review. Sir Adrian Boult and Felicity Palmer in the First Choral Symphony also take some beating (EMI 9689292, 2 CDs, with Hymn of Jesus, etc.  review  or 4404712, 6 CDs  review  or, most recently, Warner 019272, 10 CDs). For all the quality of those rival recordings, Ive yet to be convinced that either work belongs in the top rank of Holsts distinguished output, by which I dont just mean the ubiquitous Planets but Egdon Heath, The Perfect Fool, Beni Mora, Hammersmith, Brook Green and the Choral Hymns from the Rig Veda. Davis and his team, however, go as far as Sheila Armstrong, the LSO and David Atherton (Lyrita) to sway me in favour of The Mystic Trumpeter, though that recording remains essential for the Parry and Vaughan Williams couplings. The recording needs a volume boost for the softer passages at the expense of sounding a little louder than I find comfortable in the loud passages. Slovak National Opera Choir; Slovak Radio Symphony Orchestra/Robert Stankovsky  rec. 1991. DDD. American Symphony Orchestra/Leon Botstein  rec live. Date? Released 2011. I like Miaskovskys music but didnt work up too much enthusiasm for this work  hailed as the first Soviet symphony  from the Marco Polo recording: all the ingredients seem to be there and the recording is truthful in its lossless guise, but nothing really seems to catch fire. It was always said in the early days of Marco Polo and Naxos that by using less well-known Eastern European orchestras they could afford to give them enough rehearsal time to sound like the real thing, but the Czecho-Slovak performers, as they were then, still sound in the dress-rehearsal stage. Can Leon Botstein, whose live recording shaves over three minutes off the time, convey greater impact? Certainly his recording is very inexpensive  just £1.68 or less from emusic.com  though its in mp3 only and at a bit-rate of around 235kb/s. Theres very little to be gained by paying more for the iTunes or Amazon download, which wont be at a much higher rate. I still wasnt convinced that this came anywhere near the best Soviet-era symphonies, even to Miaskovskys own best, but Botstein brought me closer to enjoying it than Stankosvsky. When Mercury released this recording on LP in the UK in 1958, the American composer Walter Piston was so little known that a biography and summary of the style of his music  eminently the work of a thoroughly professional craftsman  had to be included in the review. I was about to say that he was better known now, but Im afraid that wouldnt be true. Apart from his Incredible Flutist, his music is hardly represented in the recorded catalogue; as far as Im aware, this is the only currently available version of the Third Symphony. If you rightly sense an element of damning with faint praise in that 1958 summary, you have put your finger on the reason for the neglect, together with Pistons high reputation as a Harvard academic theorist, and I have to admit that Ive fought shy of tackling anything other than the Flutist. There could hardly be better advocacy than Howard Hansons for his fellow composer and I enjoyed this reissue sufficiently to encourage me to investigate Pistons music further. There are more recent recordings of the Second and Fourth symphonies (Tilson Thomas, DG Originals, and Schwarz, Naxos  review  respectively) but a modern version of the Third would hardly come amiss. Theres another Naxos Classical Archives recording of Pistons Fourth Symphony (9.80239, Ormandy, with Roy Harris Symphony No.7 and William Schuman Symphony No.8  rec. c.1954, from classicsonline.com, mp3, not available in the USA and other countries). The CBS recording has worn slightly less well but this authoritative performance is still well worth hearing. Qualifying for Bargain of the Month status is Leon Botsteins recording of the Second Symphony with his American Symphony Orchestra on their own download label  just £1.26 from emusic.com and at a comparatively high mp3 bit-rate for that provider, around 240kb/s. This is just one of a large number of American Symphony/Botstein live recordings, often of rare repertoire, available from emusic.com, some for as little as £0.42. The MusicWeb International Classical Editor and I have been listening to a number of these recently; Im hoping to include a feature on them in a future edition. A powerful and brightly recorded account of the Konzertmusik gets this album off to a rousing start but its the two main works that really count and here the new recording would have been up against some powerful competition, not least from Wolfgang Sawallisch on a 2-CD budget-price set formerly from EMI but its no longer around (look out for second-hand copies). Im also still fond of the Ormandy recordings of the two major works on a budget-price Sony recording now available only for streaming from Naxos Music Library. The Kletzki recording of the Mathis Symphony is also deleted on CD and the passionato.com link which I gave in 2011 is also defunct but 7digital.com have it as a download, with Abbados Symphonic Metamorphoses and Oistrakhs Violin Concerto. More recently John Neschling and the São Paulo Orchestra have recorded Mathis and Metamorphoses with Nobilissima Visione, a recording which John Quinn liked more than Dan Morgan and myself (BIS-SACD-1730  review and DL Roundup August 2011/1). With so many fine recordings from the past deleted, including Bernsteins DG recording with the Israel Phil  amazon.co.uk have one copy left as I write  and not even available as downloads, that leaves the new Hyperion in a straight fight against the BIS, which is also the only one available as a 24-bit download. I opt decisively for the Hyperion: not only is the 24-bit sound of very high quality indeed, the performances come much closer to those classic alternatives than the BIS. Its 50 years since Hindemith died  and, coincidentally, since I discovered his music from the University record library  and in the interim the musical world has not done him great service. Lets hope that this fine Hyperion recording marks the beginning of better things. How appropriate, then, that I downloaded the recording on the day of Nelson Mandelas memorial service. More to the point, I greatly enjoyed music, performance and recording. I see from the review that the Third Symphony employs serial technique  hmm  but the two ballet suites here are thoroughly approachable. The classicsonline.com version came in mp3 format only at the time of writing  lossless flac seems to take a while to materialise from this source and comes in the form of one long file  so you may prefer to look to eclassical.com. A word of caution, however; the eclassical.com policy of charging per second doesnt take into account that the CD comes at budget price, typically around £6, so their $12.49 is not competitive. Both classicsonline.com and eclassical.com also have the Delos recording of these two works, derived from a Russian Disc source: see review, from which I deduce that the sound on Naxos is preferable. Ruggiero Ricci (violin) Brooks Smith (piano)  rec. 1954. La Calesera  not Caleseza, as per the Beulah cover  is a zarzuela, a characteristically Spanish form of operetta, composed in 1925 by Francisco Alonso, also known as Francisco López. I cant find any reference to the performance recorded here but the cast could hardly be excelled. Its great fun, even though Beulah dont offer a libretto or even a summary  youll find a Spanish synopsis here. The recording has worn well, with just a trace of distortion in the loudest passages and the highest notes. Sarasates music is less popular today than it used to be  I can find only one recording of the complete Danzas in the current catalogue  so the return of the classic Ricci recordings will be very welcome for many. For my own part a little of such music  or of the Paganini Rhapsodies, another Ricci special  goes a long way but Im sure thats a minority view. The playing is phenomenal and the recording (MCA) has come up well, with only very minor traces of harshness in the piano sound and in the violins top register. For those looking for just the Sarasate Danzas they are due to appear separately on Beulah Extra 1-8BX247, with Caprice Basque on 9BX147, Introduction and Tarantella on 10BX247 and Zigeunerweisen (Gypsy airs) on 11BX247. BEULAH1PD86 [75:54]  from Amazon and iTunes. This is tailor-made for those of us who remember organists like Reginald Dixon at the consoles of their mighty beasts as they rose out of the floor. There are no visuals here, of course, but an audio record of a master of his trade who recorded for the Vogue label  I think there were some later stereo LPs, too. This Wurlitzer, in San Francisco, was more powerful than any Hammond instrument. Its all unashamedly showy, complete with fairground-organ additional noises at times and lots of smoochy portamento, but its very enjoyable and the recordings have come up very well indeed. I predict a best-seller and not just among those of a certain age. Originally my intention was to compare two newish releases of the Bach orchestral suites: the Freiburg Baroque Orchestras new reading on Harmonia Mundi, and a reissue of an old release by the Akademie fur Alte Musik Berlin, also on Harmonia Mundi (HMG501578.59 There seems to be a problem with this download; Ive also reported it to eclassical.com and received a promise that it will be fixed. BW). Unfortunately some kind of eClassical downloading snafu, the first Ive ever experienced on that site, barred me from acquiring the latter. An email to customer support went unanswered. At any rate, I can tell you that the Freiburg Baroques recording is very good. Since theyre on period instruments theyve got a leg up (for this listener at least), and the main competition is the also-excellent Café Zimmermann ensemble on Alpha. The Zimmermann recordings come in a six-disc box set of as many Bach concertos as your heart desires, and is one of my bargains of the decade. One difference worth pointing out to period-instrument aficionados: Café Z. uses just eleven string players in the big Third Suite, whereas the Freiburgers expand their ensemble to sixteen strings. The new Freiburg disc has a lot of good touches. The solo flute in the Second Suite is very good, and that suite in general is a little gentler, less vigorous than Café Z. The notorious Air from Suite No. 3 eschews harpsichord for a very simple, pristine feel. Nowhere is there anything to complain about, and Ill be happy to keep them alongside Café Z. as my top choices. This Fauré quartet is as good as they get. The Kungsbacka Trio and violist Philip Dukes dial up the melodramatic intensity to 10 from the first seconds, and hardly ever let up. Plus, the players have the polish, give-and-take, and expressive harmony of the most seasoned chamber musicians. Hardly a surprise, since the Kungsbacka Trio have already united for superb Schubert, Mozart, and Haydn (Philip Dukes you may remember joining the Nash Ensemble for Mozart string quintets on Hyperion). My gold standard for the Fauré piano quartets remains the Trio Wanderer and Antoine Tamestit on Harmonia Mundi. When I say the new recording is nearly as good, thats not a slight to this recording. The Trio Wanderer Plus One are so breathtaking, both in power and in lyrical excess, that calling this second place is like saying a detective is almost as fun as Sherlock Holmes. Also I assume that Piano Quartet No. 2 is coming on another CD, because this one is loaded with other goodies. Dukes departs for the Piano Trio, and in a sort of Haydn Farewell effect, the cellist drops out next, followed by the violinist for a solo piano encore. This second half is as lovingly played as the first. Im pretty thrilled with this disc; the Kungsbacka Trio does nothing but exceed expectations. This guitar recital feels very classical in orientation. It starts with the performers own arrangements of Scarlatti sonatas, continues with a hybrid sonata by Anton Diabelli, then jumps ahead to the neoclassical, easygoing sonata by Lennox Berkeley. The Diabelli is a fusion of two works which was originally rearranged by Julian Bream. After this just 15 minutes of the hour are dedicated to the typical Spanish-world stuff. Theres also a spiky, gutsy new work by José Manuel López López, which Kyuhee Park plays with panache. Park is yet another quality contest winner in the Naxos Laureate series, which is as reliable as they get. Producers Norbert Kraft and Bonnie Silver dont miss often, on either talent or recording quality. 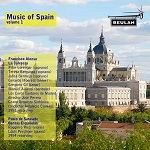 This ones unusual un-Spanish bent may make it of interest, especially if you want to hear the work by Lennox Berkeley. Parks transcriptions of Scarlatti are very good, although she could bring a little more wit and sparkle to K14. Recommended. Alexei Lubimov uses the mute to play the opening movement in Moonlight, but the effect backfires, because his piano (a replica of an 1802 Érard) produces a muted sound which comes off percussive, tinny, and awfully harpsichordish. The instrument reveals a more amenable sound in the minuet, and then in the finale, which Lubimov takes at an unusually broad tempo and treats to major changes in tempo between subjects. Its a more flexible, pliable performance than you might hear in other period-instrument readings, which tend to drive the work hard. Lubimov is up against one of the classic Waldstein performances in Ronald Brautigams, and his slower tempos dont fascinate quite so much, nor make so vividly clear the newness of the piano. You have to remember, this sonata exploited new instruments which offered sounds that had never before been heard. Actually Lubimovs is one of the slowest, most flexible performances on any instrument, taking longer even than Gilels (DG). Many listeners who are sick of the period piano being used as a battering ram, to knock down walls in search of the fastest, most metronomic possible interpretations, will consider Lubimov a merciful relief. He is opposed to that whole philosophy. I think he does best in the Tempest, the Sturm und Drang fire of which turns out to suit his approach extremely well. Henk de Vlieger has been very lucky: his orchestral hour-long suite on Wagners Ring has already been recorded three times. First came Edo de Waart, the dedicatee (I havent heard that one); then came Neeme Jarvis Chandos recording, which dispatches the piece in 60 minutes flat. This one takes five minutes longer, I think largely because the most operatic, drawn-out excerpts near the end are conducted more slowly. For the fun stuff, like the Ride of the Valkyries, theres little difference between the accounts. What about de Vliegers suite? Well, if youre like me and like Wagner but dont much like singing, this is a pretty good option. All the music is here, though most of it is truncated; get Soltis classic Decca highlights album if you want the full magic of the Fire Music or all eight delicious minutes of Forest Murmurs. (Here its cut to two.) You certainly get a pretty good sense of the story from the way that the highlights are developed and woven together. I cant complain one bit about the Royal Swedish Orchestra or Lawrence Renes, nor the sumptuous sound we all expect from BIS, so it comes down to a matter of taste. Do you prefer the no-nonsense Järvi, plowing straight ahead, or this more yielding, flexible reading? By the way, the cover photo is really a colorized photograph from a Royal Swedish Opera production, not a graphic design fantasy. There are more photos in the PDF booklet. This reminds me of afternoons at the university conservatory, in the chamber music hall, listening to people I kind of knew play music Id never heard, brain turned to standby mode, simply enjoying. Adolf Buschs chamber music is the kind of thing where you could put it on, say Guess the composer!, and have a roomful of people completely stumped. The Suites third movement sounds a bit like Schumann (main theme of his piano quintet); theres a moment somewhere that sounds like a Johann Strauss quote; the fluid, easy clarinet writing can sometimes evoke Brahms. Adolf Busch was, of course, a legendary violinist and chamber musician, who collaborated notably with Rudolf Serkin. Theres a whole bunch of clarinet music because he wrote it for his clarinet-playing wife, almost always intending to play the works with her. The opening duet for the couples instruments is the most obvious example. On the other end of the spectrum, ensemble-size-wise, is the Humoreske, which even throws in a trumpet, although dont expect anything jokey. The booklet is right to compare it to Richard Strauss; it feels like a grand tone poem shrunk to the smallest possible length and instrumentation. None of this is profound or life-altering. None of it is boring or bad, either, although I was not enamored with the Serenade. If youre interested in the repertoire, or just need something easygoing for a rainy Saturday spent reading by a fire, I say go for it. This ones easy to review: its a dud. Emmanuel Krivine does have original, unusual ideas about how this music should go, like the smooth legato trumpet statement of Mussorgskys Promenade tune, but the performances consistently lack heft, darkness, and excitement. Its all rather, well, French. Ive been very impressed by the Luxembourg Philharmonic before. Theyre an outstanding orchestra, and more than most orchestras in France itself they retain the kind of French sound we associate with the orchestras of Ansermet or Martinon. The Luxembourg recording of Gabriel Piernés ballet Cydalise is the kind of ravishing orchestral spectacular everyone should enjoy with their stereos cranked up to ten (or eleven?). Unfortunately the orchestras strengths do not help it with the ferocity of some of the Pictures, or with the brooding power of Scheherazade. Actually, I bet theyd do better under another conductor. The woodwind solos, gorgeous as ever, are the only consistent strength to this otherwise disappointing album. Go buy the Pierné instead. This turned out to be my favorite Vivaldi release of 2013. The performers have a perfectly-controlled wildness. Thats not really a contradiction, is it? Think about a film performance by Robert De Niro, or John Cleese as Basil Fawlty: through discipline, diligence, practice, and technical genius, the actors give us the sense of being totally out of control. Thats what Riccardo Minasi and Dmitry Sinkovsky achieve with their violins in these concertos for two. Ferocious attacks, see-sawing portamenti, and a big dynamic range come hand-in-hand with all the usual period-instrument goods. The ensemble is twelve players plus the two soloists. The only issue is one of programming: pretty unusually for baroque albums, almost every concerto is in a minor key, including the first four in a row. I found myself yearning for some major-key variety to spice things up! Still, if youre a Vivaldi lover or a collector of this series, its hit another high point. Ill be an eager customer for the next volume.